A Wave From It All - Spectacular 3 Story Home Just Steps from the Ocean! We will be happy to provide all the information you need to buy or sell real estate in the St. Augustine, FL and surrounding areas. As the premier real estate agents in the St. Augustine area, we look forward to serving you and will be happy to help at any time. 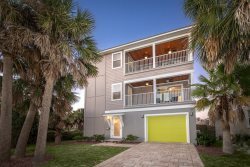 Call 904-461-8878 for more information on our properties for sale.